Masters (MSc) course in nanoscale science and technology – Nanofolio MSc degrees in nanotechnology, nanoscale science and engineering. Full-time MSc study entails a 12-month programme, split between Leeds and Sheffield campuses. In order to complete the full MSc programme, you must complete the eight lecture modules and a major project, as described below. Each module is valued at 15M (Masters credits), and the project is valued at 60M, giving a total of 180M credits. 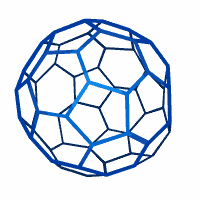 Above: Image of a gold nanoparticle. This module covers the principles of nanostructure production, laboratory preparation and the limitations of materials, including nanoscale fabrication and characterisation technologies, and commissioning as well as working in ultra-clean environments. 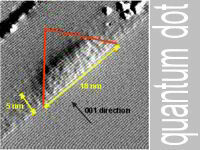 Above: AFM image of a quantum dot. This module covers the physics and technology of semiconductor nanostructures, considering both the present status and possible future trends. 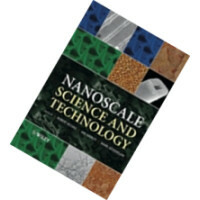 It includes ultra-small and low dimensional devices (quantum wire and quantum dot lasers, single electron devices); self-assembly of semiconductor nanostructures; physical processes in semiconductor nanostructures; electronic and optical characterisation techniques for semiconductor nanostructures. 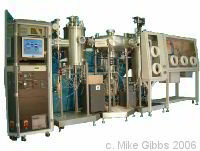 Above: Photograph of equipment used for preparing nanostructures. This module will review basic magnetic properties, and demonstrate how control of the nanostructure in bulk materials, optimised growth of thin films and multi-layers and nanoscale patterning are opening up new areas of science and technology. 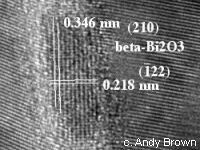 Above: Bismuth oxide precipitate at the grain boundary of a ZnO varistor. Andy Brown, University of Leeds. 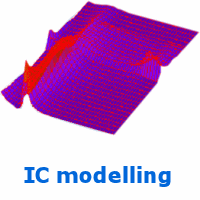 This module covers the application of the physical principles underlying microstructural control on the nanometre scale to design an appropriate synthesis route for inorganic nanomaterials including: preparation, properties and characterisation of nanostructured materials and nanoparticles; interaction with surfaces; catalysis; applications. 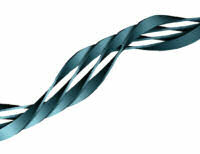 Above: Fibrillar structure formed by the self-assembly of four ribbons of peptides. This module covers the principles of self-assembly, self-organisation and its application to biology. Also covered is phase behaviour, structures and properties of thermotropic and lyotropic liquid crystals, block copolymers, and ordered colloidal dispersions. Above: Chemical patterning of a polymer film. Böltau et al. Nature 391 877 (1998). This module covers the principles of surface and interface chemistry. It includes techniques for surface manipulation, coatings and non-lithographic pattern methods; inorganic/organic hybrid interfaces; interaction of fluids with natural and patterned surfaces. Above: Fluorescence of polymers and polymer additives. This module covers the physics and applications of low-molecular and polymeric organic semiconductors. The first part of the module will discuss how semiconducting properties can arise in organic materials, and the issues of light absorption and emission, charge injection, and charge transport in organic semiconductors, as well as the processing of organic semiconductors. The second part of the module will discuss current and future devices based on organic semiconductors: photocopiers, synthetic metals, organic transistors, organic light emitting devices and organic photovoltaics. Above: Existing cellular machinery driven by biochemicals such as ATPcan serve as templates for new nanotech devices. This module covers: interactions of biological molecules with surfaces; manipulation of bio-molecules on surfaces; transduction and control of materials and information through biological interfaces; bilayers; bioelectronics; biosensors. Above: Photograph of a student using a high resolution field emission gun (FEG) transmission electron microscope. AFM image of a thin film about 120 nm thick of poly-vinyl pyridine-β-ethylene oxide block copolymer.